At Chivalry Today’s Swords Of Chivalry Historical Fencing workshop, students of all ages get to try their hand at medieval sword-fighting techniques. Let’s face it – chivalry is a fascinating topic, but a big part of the lure and lore of the ideals of chivalry is imagining yourself as a gallant knight of old. Now all of Chivalry Today’s fans and followers are invited to come and make that fanciful image a reality (at least for 90 minutes!) at our Swords of Chivalry Historical Combat workshop. 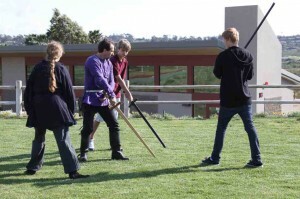 Swords of Chivalry Historical Combat is a weekly training session and workshop held at San Diego’s acclaimed Team Touche Fencing Center, centrally located in Sorrento Valley. Held from 5 to 6:30 pm every Friday evening, the goal of these workshops is to allow attendees to experience the authentic style of the knightly “art of defense” – a surprisingly complex and dynamic skill! Swords of Chivalry Historical Combat is great for children who aren’t “into” traditional competitive sports; re-enactors and LARP gamers; actors and stage combat coordinators; parents and children who want a mutual bonding activity; athletes seeking a challenging cross-training activity; and anyone who wants an enjoyable exercise activity that emphasizes balance, coordination and range-of-motion (like yoga, but with a sword!). Most importantly (from our point of view, at least) the focus at the Swords of Chivalry Historical Combat workshop is not just on learning and mastering a physical skill, but also on celebrating and sharing the ideals of the code of chivalry – respect, trust, sportsmanship, discipline, focus, gratitude, and honor. Every Swords of Chivalry Historical Combat session is conducted in a safe, supportive atmosphere that brings out the best in everyone, regardless of their age, gender, or physical aptitude. This class isn’t about bashing, smashing, and then proudly comparing bruises – this is a chance for everyone who values the ideals of chivalry to put those principles to practice, as well as to foster the concept of chivalry in our younger sword-combat practitioners. Chivalry Today is delighted to partner with Team Touche for our weekly Swords of Chivalry Historical Combat workshop, and we deeply appreciate Team Touche’s support and hospitality. We’ll have a sword waiting for you at the next Swords of Chivalry Historical Combat workshop – we hope you’ll come and join us!